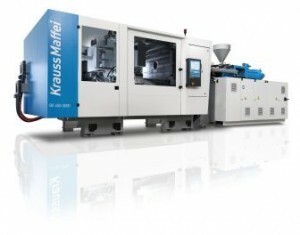 At KraussMaffei’s world premiere event on May 15 at its Munich, Germany headquarters, the company presented to visitors for the first time its new GX series of injection molding machines with a clamping force ranging from 400-650 tons. Six of these hydro-mechanical dual platen machines were displayed, featuring new technologies such as the GearX locking device and the GuideX guide shoe. KraussMaffei stated that they are good in production of free falling packaging parts and quality articles for the automotive industry or the consumer goods sector. With the ingenious GuideX guide shoe, forces are ideally absorbed and the service life of the molds is increased, according to the company. As an intelligent fixed bearing joint with an optimized FEM design, GuideX ensures good platen parallelism due to the stable design and guarantees smooth, energy-saving movements. Meanwhile, the innovative GearX locking system is activated straight away within the shortest possible time and continuously produces quick machine movements. Arranged in a space-saving way behind the moving mold fixing platen, KraussMaffei said it facilitates simple access and numerous customer-specific options. For the first time, the MC6 control system has been equipped with a so-called “Eco button” to achieve the most energetically program, the company noted. The new “SplitScreen technology” shows the operator all important production processes at a glance. The integrated ProcessDesigner tool clearly presents all current processes in visual terms and enables operators to modify them, depending on requirements, by means of simple drag-and-drop movements or wiping movements. In the modular drive system of the GX series, the latest generation of the variable delivery pumps is a standard feature, KraussMaffei emphasized. Through the optional use of “Blue Power Servo Drive” technology, energy consumption is further optimized compared with variable delivery pumps. The saving amounts to 10-30% depending on the particular application. Compared with conventional hydraulic concepts on the market, savings of up to 50% is said to be possible.